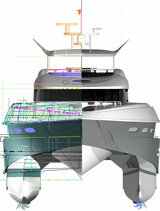 We recently discovered one of the best web sites of any yacht designer or naval architect that we have seen to date. Featured here is a 33m wave piercing motoryacht designed by Bakewell-White Yacht Design for New Zealand Yachts. Through wonderful computer modeling and analysis and tank and wind tunnel testing, the NZ01 Wavepiercer 33 was refined aesthetically and functionally to deliver extraordinary speed, passenger comfort and operating efficiency. The work of Bakewell-White Yacht Design is far reaching from sleek racing and cruising sailboats to luxury motoryachts to a fleet of high speed RIBS. We have chosen to feature but one of their designs here because we believe it is important to give our visitors a feel for the expert craftsmanship and artistry involved in their design process, from sketches to 3d models to tank testing to analysis. After reading this, you have to visit their site to see the full range of their designs, each worked to the same degree of perfection.